Bitters from the past and the present. During the 1800’s immigrants came to the New World from far off lands. Some of these early settlers brought their primitive methods of healing with them in the form of root teas, bitters, tonics and elixirs. Root teas were already well established for healing from the Native Americans who lived in the New World and they taught the immigrants methods of healing, some of which still exist today. 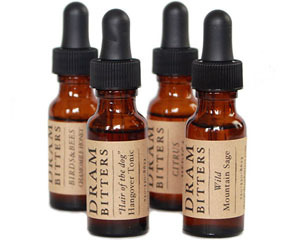 Bitters are powerfully concentrated forms of herbal healing that date back to the dawn of man. They are still used for ailments that range from stomach disorders to the healing of circulatory systems in the body. Bitters also have a secondary purpose. Not only do they have medicinal purposes but their bitter flavor and concentrated aromatics that just happen to be delicious in cocktails. 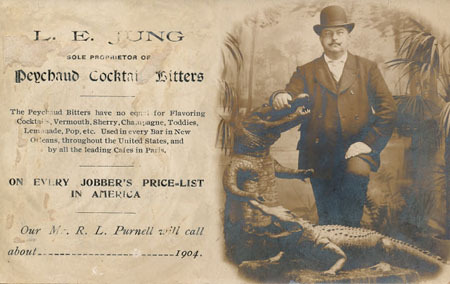 It’s pretty well established that bitters have been used in the cocktail arts since Antoine Amédée Peychaud created his namesake bitters in the earliest concoctions that evolved into our modern day cocktails. 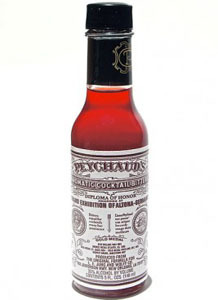 Peychaud’s Bitters were originally created to stave off dysentery and other debilitating afflictions of the digestive tract. 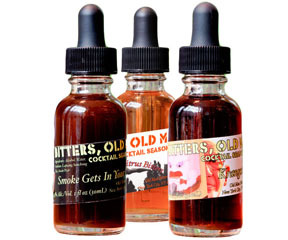 Please remember that during the mid 1800’s, refrigeration and good sanitary practices were all but unknown so the use of bitters in healing was not just a trend, they were absolutely necessary! Some of the oldest brands are still used today like Peychaud’s Aromatic Bitters. Indispensible in cocktails like the Sazerac, Peychaud’s distinctively red color seems to signify strength and power over illnesses of the belly. Angostura Bitters an equally venerable brand was also originally formulated to be effective for afflictions of the digestive tract. 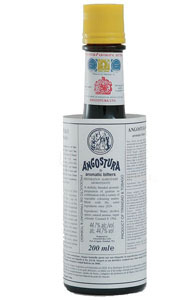 Angostura was invented by Dr. Johann Gottlieb Benjamin Siegert, a German doctor in the mid 1800’s, for use in curing stomach disorders. Tropical temperatures were not conducive for the preservation of food thus stomach ailments were prevalent during this pre-electricity period. 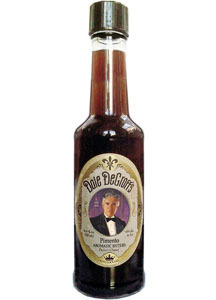 Bitters such as Angostura and Peychaud’s, although still in use today in the concoction of cocktails, are rarely used for their original purpose. But if you have a hangover or a stomach ache there are scarcely any non-medicinal products available on the market today that work as effectively without synthetically produced, chemical ingredients. The craft cocktail explosion in recent years has given creative mixologists and ardent cocktail enthusiasts the opportunity to introduce concentrated herbal and fruit driven flavors to their cocktails. 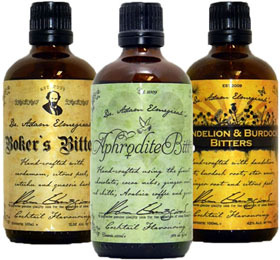 But many modern day bartenders and mixologists may not be aware of the rich history of bitters. For both Classic Cocktails and the newer versions of the classics, bitters are a thing of the past in a very modern context. 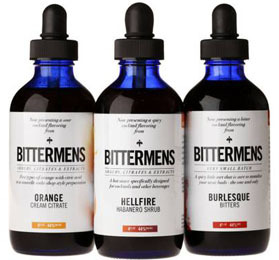 The original bitters developers in Sweden, France and Germany would scarcely have imagined the direction that the cocktail industry has taken towards flavor driven augmentations. What we have now in the cocktail world are creative mixologists unleashing flavor combinations that evoke the past, and through this past we have the present. Today's Cocktail and Speakeasy bars will have dozens of bitters on hand. Their purpose is to add an element of surprise– to unlock a secret only known to flavor. That is what high end drinking is all about. And the quality of your bitters are as important as the syrups, juices, tonics and liquors. If you are thinking of opening a bottle of tonic water you should try Q-Tonic or perhaps some Fever Tree Tonic. I’m inclined to mix some Tomr’s Tonic or maybe some Jack Rudy with either Perrier Sparkling Natural Mineral Water or Polar Sparkling Water. The thoughts of bitter and sweet in a mixed drink acts like a metaphor for life itself. Bitters are not just for stomach aches any longer! The venerable Angostura Bitters is not only for healing the stomach, but it’s also gorgeous in a drink known simply as the Pink Gin. Just a few drops of Angostura Bitters in a cupful of gin will administer great healing! The modern uses of Peychaud’s Bitters are not so far from the original uses, in the cocktail still known today as the Sazerac. From Germany, made with concentrated flavors that evoke fruits, herbs and spices. The name says it all! 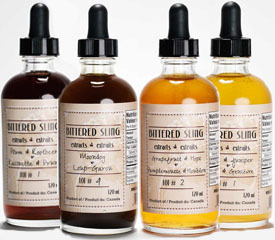 Produced by hand, these bitters are created to add new dimensions to mixed drinks. Decidedly antagonistic bitters for the most fevered dreams you can imagine. With bitters like Thai, Moroccan, Mexican Mole, Jamaican Jerk, Curry, Chesapeake Bay and Memphis Barbecue, these flavors are not for the meek. They shout, no, they scream in ancient languages not yet discovered. Their flavors exploit the fearful and reward the fearless. A mere drop of the Curry Bitters in a gin and tonic will take the drinker down the steamy path to a crocodile infested swamp. Someplace where the mosquitoes grow larger than your fist and your sunburned flesh is on the menu as the chef’s special of the day. Curry is a favored ingredient to cool the body. The turmeric element is a powerful curative against all forms of malaise. And the brooding alcohol level of Bitter End Bitters teaches us that all is not what it seems. Watch out for the Curry. They will pitch you over the edge if you’re not careful. is an uncommon name for a most profoundly concentrated and friendly spirit augmentation from one of my favorite places on the globe, Vancouver, BC. And the owners are really cool too. are aromatic and potent. Their Vanilla Bark is marvelous in a rum punch and the Bolivar Bitters unlock long gone spirits and bring flavor right into the present tense. 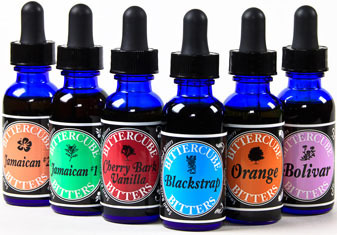 There are over a dozen concentrated bitters from this Brooklyn based bitters alchemist. With flavors like Smoke Gets in your Bitters and Krangostura, an aromatic bitters befitting Krang, the villainous anthropomorphic brain from Teenage Mutant Ninja Turtles, these are not your grandmom’s bitters for healing a cold. The venerable brand from New York State is just about the most historic brand on the market aside from Angostura and Peychaud’s. 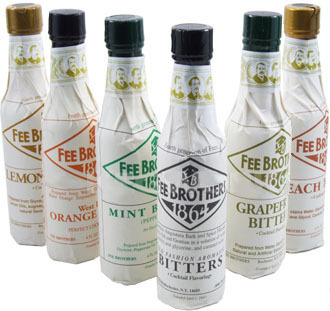 Recently the brand has branched out from the simply ravishing Whiskey Barrel Bitters to the aromatic and beguiling Cranberry Bitters along with their perennial favorites like Mint, West Indian Orange, Grapefruit and Celery. is a lush, aromatic and deeply sensual bitter from cocktail master, Dale DeGroff and Jade Alchemist Ted Breaux. This is not the typical “sock in the mouth” version of the spicy pimento, but a deeply layered experience that includes Caribbean spices, anise and aromatic healing herbs. from Colorado are an apothecary lesson in each sip. They use aromatics like the other bitters on the market, yet take a devilish turn towards traditional ingredients such as chamomile, long known for restorative and healing elements. 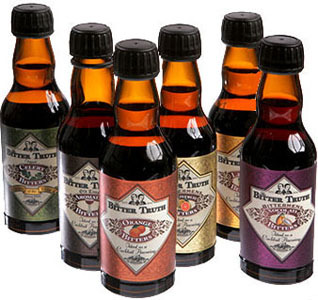 The bluntly talented bitters manufacturer produces historically correct versions of bitters such as the Teapot Bitters and the luscious Boker’s Bitters. makes a Chocolate Bitters that approaches otherworldly amongst other pure and concentrated flavors. Lush and pure with concentrated flavors gathered from ingredients including exotic Mexican chocolate and sumptuous orange peels. 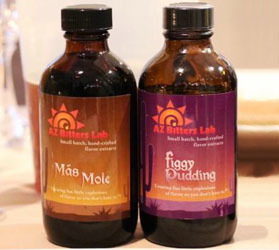 My favorite in iced tea (with bourbon) is the Mexican Mole bitters! Citrus flavors mesh beautifully with brown liquors and white (clear) liquors. They add spark and an edge to a mixed drink. Woven with Asian spices, this hearty reminder of pre-prohibition cocktailian pleasures gives depth and a crisp sense of purity to many different types of mixed drinks. What is not said about bitters on the label may well be the most important of all. They are good for you! 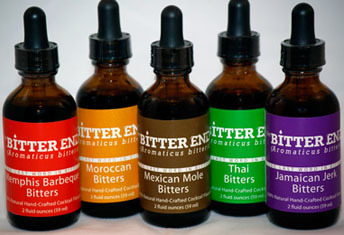 Originally bitters were used as powerful healing for all sorts of ailments from the digestive tract to general malaise. These are the hidden pleasures of bitters. 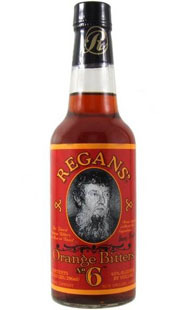 If you have a bellyache, try adding about five splashes of Regan’s Orange Bitters to a glass of seltzer water, drink it down and then repeat after an hour or so. I think you will find your breath refreshed and your stomach calmed. 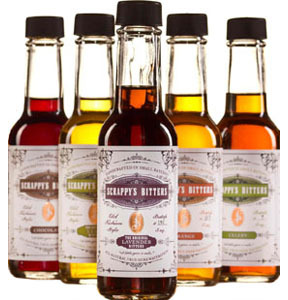 From the Tuthilltown Distillery in Gardiner, upstate New York, these bitters offer a slightly different approach to the creation of the typical cocktail bitters. The reworked recipe includes, rye whiskey, herbs, spices and maple syrup. These bitters are not your typical cocktail augmentation, but ones that offer a deeper and more concise trip into the darker side of a cocktail. They allow the drinker to find hidden meaning in every sip. The maple syrup is a favored ingredient in Minetta Tavern’s Maple Syrup Sazerac. This new classic cocktail based on the traditional Sazerac has the addition of a richly textured maple syrup in the mix of rye whiskey and absinthe. 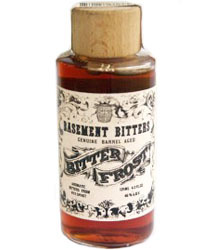 Basement Bitters have harnessed the maple syrup component in their sharply delineated bitters. A hit of sarsaparilla adds a perfect counterpoint to the sweetness of the maple. These are thirst-slaking bitters that are absolutely at home in a mixture of brown liquor and sweet vermouth. Or they may be enjoyed simply in a glass of seltzer water with a peel of citrus. from Brooklyn, NY is a crisp reminder that all in bitters are not the same. First of all the name is different than others on the market. They call the bitters Hella Bitter, offering “complexity and depth” to a drink. I see it very much the same way being a former cook. 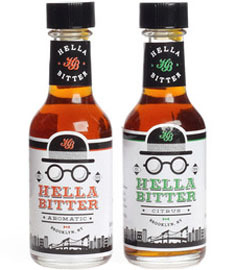 The world of Hella Bitter is a very familiar place in my life of harnessing flavor. The name is also different. Bitter not Bitters. I love the way the Hella Aromatic Bitter perks up a rum punch, or perhaps the citrus bitter in a very twisted drink with botanical gin as the primary intoxicant. Hella is about to shake up your palate, so make sure you bring an open mind to the bar. Known as "bitter liquor", is especially helpful when trying to vanquish a hangover or after a filling meal. It is also the ingredient in cocktails that adds depth and balance. The herbs and spices give great potency and balance to a number of cocktail experimentations. 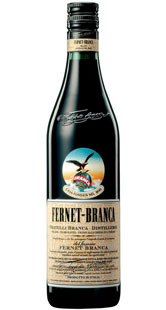 Personally speaking, I enjoy Fernet-Branca in a Rum and Coke. Other times Fernet-Branca is delicious with seltzer water and a pinwheel of lime as a powerful curative for what ails you. 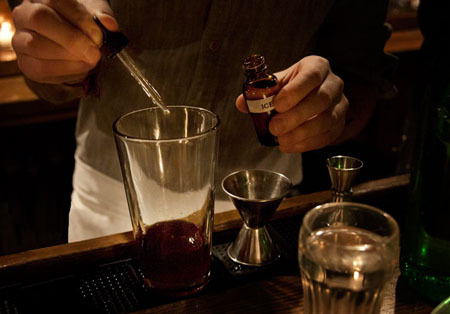 A couple drops in a Bloody Mary, for example, acts with as much intensity as a few drops of Angostura Bitters.